If you’ve never longed for a hoverboard, I seriously question your credentials for human existence. Strong statement? Sure. But ever since those levitating, wheel-less skateboards were floated into the collective conscience in Back to the Future Part II, the pull has been strong for the actual product to show up. And if it ever did, you know you’d want one. Who wouldn’t? With the ability to traverse the terrain while basically flying – plus the added cool factor of living out your wildest Marty McFly dreams – hoverboard ownership would satiate everyone’s innermost child while providing for an alternative mode of transportation. Since the film was released in 1989, it seems that every couple years we are teased with the possibility of REAL LIVE HOVERBOARDS, only to have the board pulled out from under us under the guise of “rumor” and “hoax.” It all reached a fever pitch in 2014, when skateboarding legend Tony Hawk teamed up with Christopher Lloyd – Doc Freakin’ Brown himself, people! – to create an incredibly real, yet ultimately fake, hoverboard advertisement. This only leaves wannabe McFlys with one option: Strap an Axiom Discs Proxy to the bottom of each shoe, and go for a ride. Because when this disc reaches the low speed portion of its flight, it doesn’t fade. It hovers. I normally like to keep reviews here to discs that have been recently released; the Proxy doesn’t fit this ideal, as it was initially released way back in the dark ages of 2014 and has consistently bounced in and out of my bag since then. It isn’t terribly new, but here’s the great part about disc golf: There are always new plastic blends being released, which means a chance to revisit molds that I may have missed reviewing in the past. And with the Proxy being released today in Axiom’s devastatingly handsome Plasma plastic, I am able to go back to the future for this review, firing up the DeLorean (read: Gateway laptop) and giving a spin to some new plastic that looks like Marty and Doc might have actually found it in their fictional version of 2015. Like any good sequel, though, we’ll need a little background for those who aren’t familiar with the original. 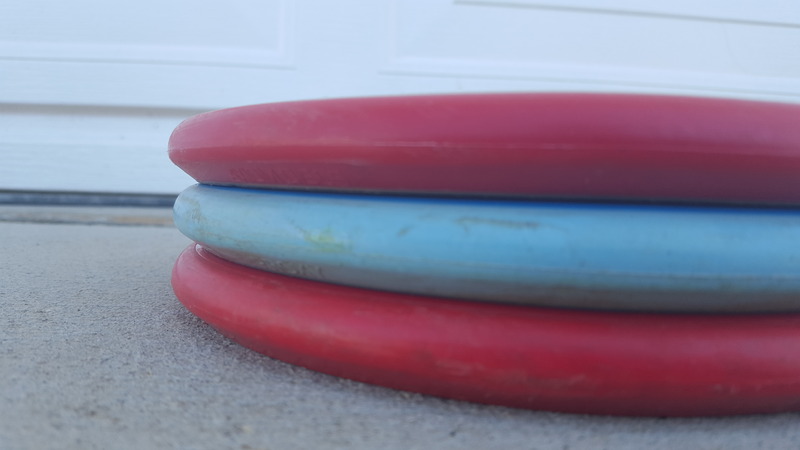 A stack of Proxies highlights the disc’s modern profile. Built off of the same core as Axiom’s Envy, the Proxy is a sleek, low-profile mold that eschews the deep dish design of its MVP Disc Sports cousins in favor of aerodynamics. Labeled as “straight-stable” by the manufacturers, a modern profile that somewhat resembles the Latitude 64 Pure complements the Proxy’s signature overmold, the gyroscopics of which are on full display on long shots from the teepad. Where the Envy combines tremendous high speed stability with a reliable ending fade, the Proxy steals the first half of its big brother’s flight and scoffs at the second half, instead replacing it with, well, nothing. Truly, the most impressive feature of the Proxy is how, at the end of its flight, it just lowers straight to the ground. It’s like throwing a traditional Frisbee that is wearing a modern disc’s clothing. As a result, accuracy has never been so easy. While some like to play the fade – generally the safer shot – both off the tee and on the approach, the Proxy lends one the ability to completely run at the basket. It has changed my game, as it is so reliably straight that deciding to take aim instead of playing the fade is not a risky proposition. It’s the right one. But just because it is so point-and-shoot silly doesn’t make it a one-trick pony. My extended time with this mold has shown me that it is capable of occupying the lone putter slot in one’s bag, if that is a player’s preference. Flat throws yield that buttery straight flight I’ve already drooled over, while a subtle hyzer and clean release can give a nice arcing path. Power that hyzer up some more and you see the essence of the Proxy: extended distance, gyroscopic glide, and a hovering, flat landing straight in front of the line of release. The Proxy will absolutely handle smooth anhyzers with ease, landing flat without cut rolling away. Need to get out of trouble? I just used the Soft Proxy the other day for an up-and-over shot that pancaked flat in front of the basket. It’s like throwing a traditional Frisbee that is wearing a modern disc’s clothing. As a result, accuracy has never been so easy. In fact, if there is any weakness with the Proxy, it’s that it can almost be too responsive, if that makes any sense. There have been times I can’t get it to hold a hyzer because I have snapped it too hard, or it’s held its line a bit longer than I needed it to and it ends up getting away from me. Could it be useful to have some more fade at the end of its flight to compensate for these (player-induced) flaws? Certainly. But that’s not what you get with the Proxy, so if you need it, look elsewhere. 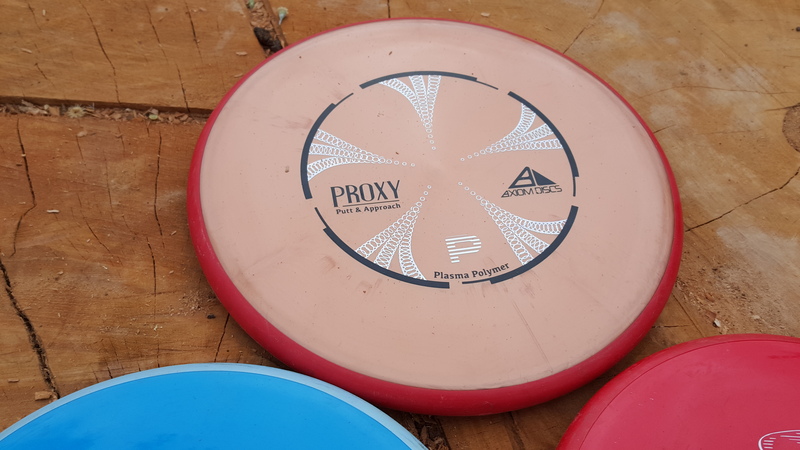 With three blends of the Proxy in wide release, the last thing we can do is compare how the disc flies across the plastics to help you choose which is best for you. The original Neutron Proxy, in my experience, feels fast. I used this blend extensively on a trip to the mountain courses of the Lake Tahoe area last summer, and it absolutely blazed downhill on elevated shots (holes 1 and 17 at North Tahoe Regional Park, for example, come to mind). All of the Neutron Proxies I’ve encountered have been a relatively stiff blend of the polymer, and they have all had a touch more high speed stability than the other releases, making them a bit more torque resistant. Toward the end of 2015, the Neutron Soft Proxy was released, and I prefer this one for putts in the circle. It has the same flat top as the regular Neutron Proxy, but the give to the flight plate helps me get a cleaner release for spin putts. The Soft does seem to have less glide off the tee and on upshots, though, so it ends up a little shorter than the other two blends. And finally, we have the Plasma Proxy. Aside from making me swoon in the same fashion that Lorraine McFly does for her son (she doesn’t know it’s her son! That’s the joke! ), this Proxy has the most glide out of the three due to a slightly higher shoulder. As a result, I have been using this one for longer putts, and for all tee shots and approaches. The extra distance is a bonus, as I get the control and extra legs needed for many long looks. Truly, though, pick your poison. Much like the Back to the Future trilogy itself, all of the Proxies are enjoyable while still keeping the spirit of the original intact. 3) LIKE and COMMENT on the pinned post for this review at the Noodle Arm Disc Golf Facebook page. For your comment, tell me your favorite movie series. Are you a Star Wars fan, or does Die Hard get you going? Bring it to the discussion, and you’re in. The contest will run until Wednesday, February 24 at 9 p.m. PDT, when a random winner will be chosen. Thanks to Axiom Discs for providing the plastic! Another great review!! And yet another putter I would love to try!! Cheers! Oh forgot to add that I am bigger Die Hard fan than Star Wars! Yippee kiyay mf’r!